This chapter will deal with the form as a ‘Fourth Quadrant’ subject, which means that the focus will be on the multiplicity of architectural features. Individual forms (buildings, houses) are brought together as conglomerates with particular structures. The form of the new unity (of multiplicity) has its own story to tell, which can be quite different from the narrative of the members in the group. The step from individuality to massality (and back to individuality) is a test case of division thinking, because it is here – in the process of change – that the deep-seated differences in view point come to light. The expression ‘the Four Corners of the Earth’ can be traced back to the Egyptian mythology and pointed to the world-as-a-house. The Egyptian sign for a city (‘niwt’) was a circle divided in four parts and one of the oldest known hieroglyphs, dating from the pre-dynastic period (fig. 508). The hieroglyph is derived from the graphic renderings of walled enclosure, which were depicted on flattened stones (palettes) found near Abydos in Upper Egypt and dating from the end of the fourth millennium BC. Fig. 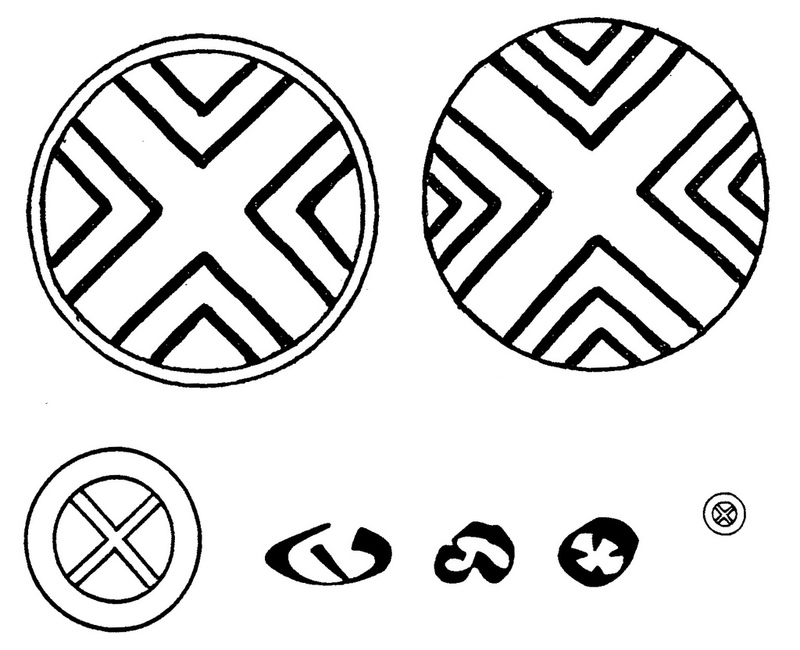 508 – The Egyptian ideogram of niwt, meaning a ‘city’, ‘village’ or a general location occupied by people. Werner MÜLLER (1961) presented the upper signs in his book on the holy cities (Rome and Jerusalem) and Maria Carmela BETRO (1995/1996) gave the lower sequence in her overview of Egyptian signs. The niwt sign had a wide application, which included all types of imaginary or real places. This apparent ambiguity might point to a type of higher division thinking in the Egyptian cultural history. BETRO (1995/1996) noted that the conception of the Egyptian ‘city’ was a difficult one. The Egyptians did not differentiate in size, population or importance. No hierarchical classification of major or small population centers was given. The ideogram ‘niwt’ pointed to a wide specter of things and notions. Every territorial unit could be indicated by the name ‘niwt’, including such imaginary places like the Otherworld or the relation between Upper and Lower Egypt. The sign already existed before the unification of the two parts of Egypt. The uncertain interpretation of ‘Place’ and its ideogram ‘niwt’ might be caused by a historic consciousness of higher division thinking. The ‘walled enclosure’ is, in that point of view, the Third Quadrant representation of a Place. However, an active notion of (three) other types of ‘places’ was present for those who comprehended a tetradic outlook. The ‘vague’ notion of the concept of a city by the ancient Egyptians could be an indication of the very consciousness of a multi-layered reality. —————— 4. Composite, a combination of the previous. These four types will be briefly discussed hereafter, with the emphasis on the human design and the use of a representational language. This division follows, by and large, the characteristics and meaning of the (quadralectic) quadrants. Various degrees of human intentions (in city building) find their roots in the position on the communication graph – i.e. the representation of the communication between an observer and the observed. The elementary beginning of this communication takes place when (poor) people leave the countryside to live in the city. There is hardly any regulation at this stage, because the authorities do not control the increase of city dwellers and the latter are too poor to contemplate organization. The second stage consist of new arrivals choosing an advantageous position. They organize facilities to make life more comfortable and create better living conditions in the initial ‘chaos’. The stage of human intervention by authorities is distinct from the previous ones because it assumes a control of power to plan city developments. The notion of (visible) design is born. The last stage, which can be seen in most modern cities, is a combination of unplanned and planned building, which took place in the past (old) and in more recent times (new), to produce the dynamic city of today.